It’s fair to say that the season 3 finale of Penny Dreadful, which aired last night (19.06.16) on Showtime in the U.S., has whipped up quite a whirlwind of panic and emotions. Concluding with the death of one of its major characters, the two-hour special episode has had fans in a stir over how the show could possibly continue past this point. And those fears have been further encouraged by the episode closing with on-screen card reading “The End”. So, are you ready to find out what happened, yet? We had our suspicions that this would be no ordinary episode when the opening credits of “The Blessed Dark”, the second half of the two-part finale, were altered from their usual graphics to a retrospective of the series. 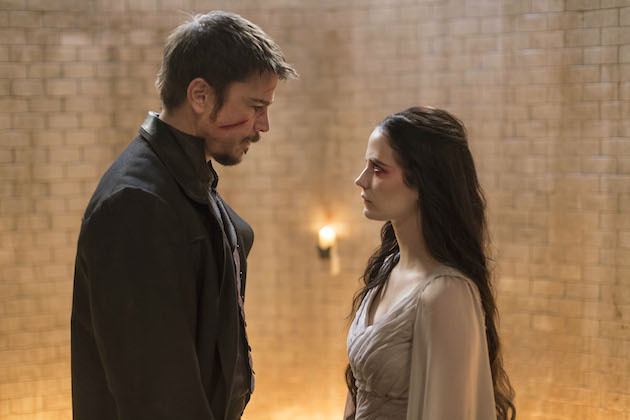 The shocking climax of “The Blessed Dark” came when Eva Green’s leading character Vanessa Ives was fatally shot by Josh Hartnett’s Ethan Chandler in an act of love, release and prayer (playing out his role as the Wolf of God by reciting the Lord’s Prayer with Dark Vanessa before killing her). The moment had been built up throughout the episode, with Ives telling her lover Dracula “Let him come, he and I shall write the ending in blood, as it was always going to be” when he informs her that Chandler is on his way. As the programme ended with John Clare/The Creature finished reciting Wordsworth’s “Ode: Intimations of Immortality from Recollections of Early Childhood” at Vanessa’s freshly dug grave, the realisation sunk in that Vanessa is unlikely to return. The beloved character lived fast, died young, and left a beautiful corpse. So now we know why the show is yet to be renewed for a fourth season by Showtime. Even if it hasn’t been officially cancelled, is Penny Dreadful worth continuing without Vanessa Ives? The two hour finale of Penny Dreadful airs tomorrow (21.06.16) from 10pm on Sky Atlantic in the UK. Stay tuned for more news on the show as and when we hear it!